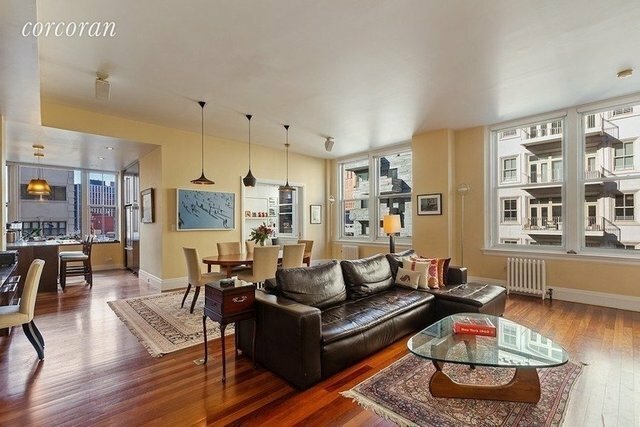 Lovely sunlight and expansive living spaces provide the perfect Tribeca lifestyle in this park-adjacent three-bedroom, two-bathroom loft residence in a landmarked co-op building. Spanning roughly 2,000-square-feet under soaring 11-foot ceilings, this corner home is the epitome of effortless loft living. The inviting entry gallery is lined with a full bathroom and generous closet space, nodding to well-planned touches to be found throughout the home. Ahead, the spacious great room is flanked by extra-tall windows and built-ins, providing a light-filled footprint for luxurious living and dining areas. Lovely hardwood floors usher you to the adjacent windowed kitchen where you'll find abundant cabinetry, a massive granite center island/breakfast bar, and premium stainless steel appliances, including a vented gas range, wine refrigerator and dishwasher. Arrive in the enviable master suite through a decadent dressing area lined with custom closets. This area can also be used asa home office or play room / Den. Double doors swing open the spacious bedroom, and the en suite master bath is beautifully equipped with a soaking tub, separate shower and double vanity. Two more sizable bedrooms flank the great room, each offering large closets and huge windows. Bedroom 3 is currently used as a den/family room w/ hidden murphy bed. Combined sound, an in-unit washer dryer and private storage bin add convenience and ease to this spectacular Tribeca co-op home in a sought-after school zone. Built in 1900, this New York City landmark served as home to apparel retailer Rogers, Peet Company for 70 years. Today's residents enjoy video security, live-in superintendent, central laundry, storage and a bike room. Pets and subletting are permitted. Situated across from City Hall Park, this location offers the ideal mix of Downtown allure and open green space. Washington Market Park and the Battery Park Esplanade are within easy reach, as are both Brookfield Place and Westfield World Trade Center. The Tribeca Whole Foods is just three blocks away, as are two different Farmers Market's. And, transportation options from this highly accessible neighborhood are abundant with R/W, A/C/E, 1/2/3, 4/5/6, J/Z and PATH trains all nearby.Seeing is Believing! !